My organization, Earth Charter Indiana, has a lot going on, from our youth program, Youth Power Indiana, to our decade-long project, Sustainable Indiana 2016, to our interactive art program, Hands On Indiana. And that's just for starters! But lately we've reckoned that we might want to narrow our focus just a bit. After all, we're experiencing record-shattering heat these first couple of months of 2016, while 2015 was the hottest year ever recorded. The presidential election, while ostensibly exciting, is nevertheless not focused on the climate crisis; in fact, one party is almost completely ignoring it. Talk about the elephant in the room. Do I need to walk you through more current environmental news? I think not. You know that it's bad, bad for all the creatures on the planet, and while there's good news for sure, it's not yet at a scale that's going to put a dent in the suffering. The need to mobilize, quickly, is paramount, and expressed most urgently by Margaret Klein Salamon. So what to do? How shall we at ECI focus our attention? The convergence of me and ECI is a long, magical story I won't get into other than to note that it was the work of Our Children's Trust that brought us together. The Earth Charter itself is pitched as a legacy blueprint; we have to preserve this earth for future generations. So when we learned that kids in Eugene, Oregon, had helped pass the nation's first Climate Recovery Ordinance, we knew we'd found something special. It wasn't until high school students in South Bend gathered together their fellow youth along with adult support last December (2015), that the Climate Recovery idea really took root here in Indiana. And now, we're starting up groups in a couple of Indiana cities. Here's the basic idea: Young people (elementary through high school) create a community of kids united by an urgency to solve climate change; they work with their elected officials (city council, mayors, plus city planners and engineers) to understand their municipality's position and progress regarding greenhouse gas reduction, energy efficiency increase, recycling, and other factors. It's part climate stewardship, part civic leadership, an unbeatable combination from our point of view. A national-scale organization, iMatter, has a whole strategy plan available to all. Do we have any other choice than to try? Recently, I took this youth-led Climate Recovery project idea directly to Shane O'Day, the remarkable principal of Shortridge High School. He was kind to give me the time: principals are busy people! But it only took about 15 minutes of discussion before he declared he loved the idea and was ready to turn me loose in the school. I began my immersion during school lunch, basically going from table to table with a quick explanation of Climate Recovery and a clipboard in case they wanted to write down their contact info. 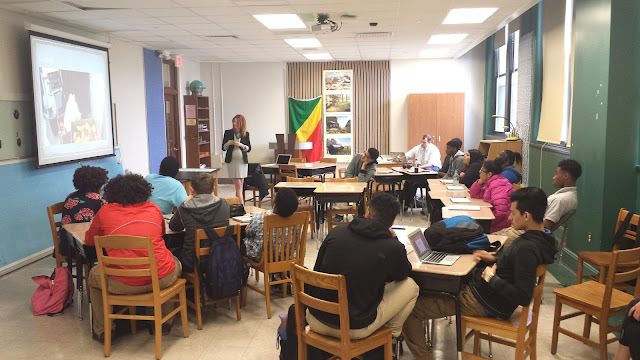 That was working pretty well over the course of a couple days, but what worked even better was when the earth science teacher, John Brady, who is also vice principal of the school, invited me to come to his class to present on Climate Recovery. Shortridge has two earth science classes, Brady's and Jessica Carlson's, so I ended up going to both and pitching them the idea of helping research this complicated but vital project. They agreed, and what's happened over the past couple of weeks serves, I believe, as a kind of template for other schools. In fact, I will try from here on out to present this as a handy-dandy how-to guide, in case you'd like to tackle this yourself. 1. If you sign up at iMatter's site you get all sorts of useful tools, including a report card. This report card, for the city of Ventura, was shared with the students early on in the project formation, and enabled them to structure their research along the categories covered by the report card. 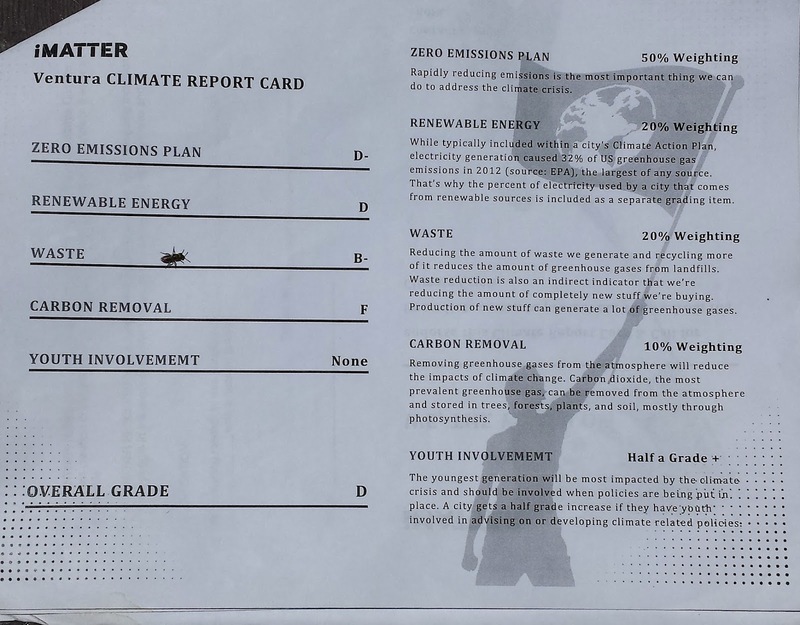 Note: the report card is ideally taken with a city engineer or sustainability officer as part of the learning process. 2. Next we created a Google Docs community where we could share information with each other. 3. Next, we brought in professionals and experts to talk about the different categories as determined by the report card. 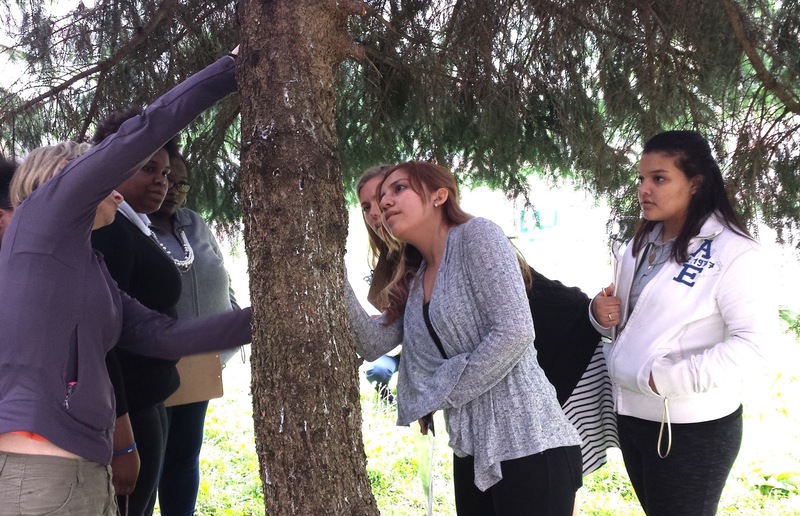 Below, Holly Jones (left) from the Indiana Urban Forest Council, visited the class to talk about carbon removal in the form of how trees sequester carbon. She was very helpful, actually getting the students to measure a tree in their courtyard. Students were energized by this visit to the point where they are going to assess all the trees in their school area using tools to calculate carbon sequestration, stormwater management, and air pollution mitigation. 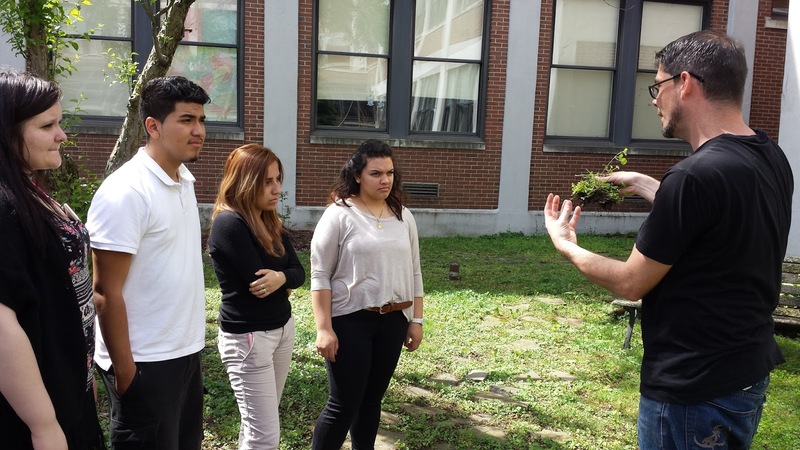 The students plan to plant a tree at their school in the coming year. 4. Jennifer Brilliant (to the left of center, standing), from Food Rescue, talked to the class about capturing edible food from their cafeteria system that would otherwise be thrown into landfills to rot and create methane emissions. This edible food can be taken to food pantries or hunger relief agencies. This was helpful to the students in understanding the issue of reducing waste. A couple students plan to start rescuing food before the end of the semester to start research on this specific program. 5. We were fortunate to spend time with Kevin Allison, from the Marion County Soil and Water Conservation District. Allison is an expert in the field of carbon farming and how soil sequesters carbon — an essential action in carbon removal. 6. 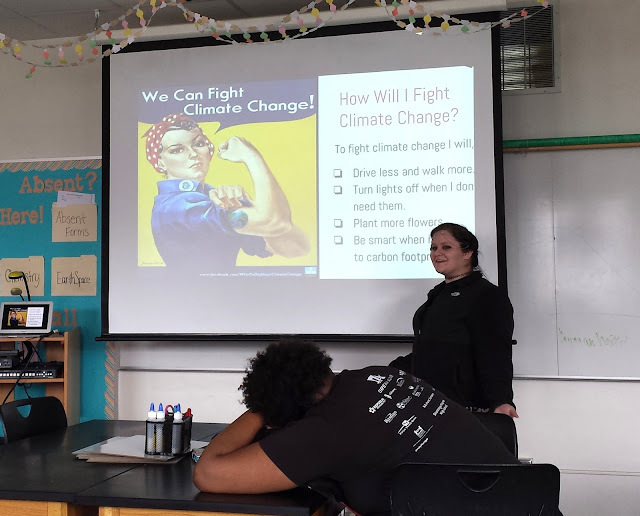 In addition to collecting information and links into the folders, students in Ms. Carlson's class did a series of presentations on developing technology that could be instrumental is solving our climate crisis. Each presentation also contained personal commitments from each student. 7. If you are lucky, other things will fall into place. In this photo below, you see Molly Denning, a youth leader with whom we work. Shortridge was throwing a service festival and invited me, unrelated to the Climate Recovery project. 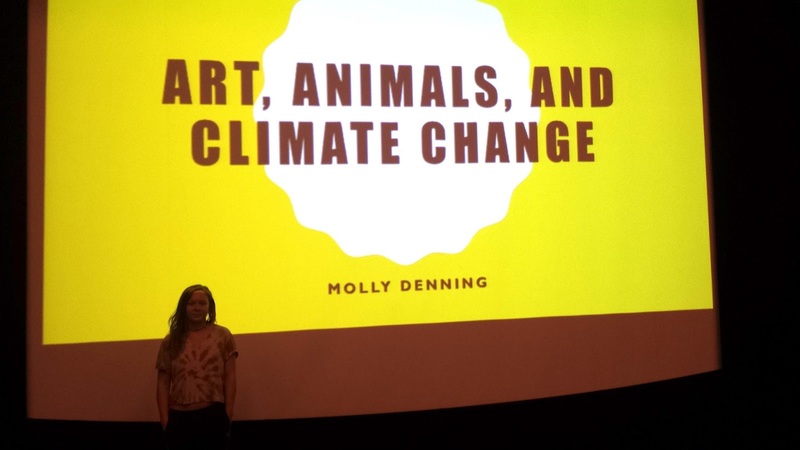 I said yes, then handed the presentation time to Molly, who talked about why she dedicates her work and art to raising awareness about climate change and animal extinction. Molly visited one of the individual classrooms as well, to talk about the category of youth involvement, but this presentation was in the main auditorium to students not necessarily participating in this Climate Recovery research project. The key here is not only getting professionals from the community into the school to help with hands on researching, but if you're fortunate, you can get a youth to visit. There's nothing more powerful, really, than peer-to-peer instruction. I hope we can launch numerous research projects across the state. It's one thing to research something in a hypothetical context. It's something quite else to research something that might prove useful in making real change. I'm sure you'll discover actions and approaches that improve upon ours; please share those successes with us.